National Horseplayers Championship [NHC] winner RAY ARSENAULT of Ontario didn’t have to go far and didn’t have to wait long to get his Eclipse Award as the 2017 Handicapper of the Year. Arsenault reaped his reward this January in Las Vegas when he won the $800,000 grand prize at the NHC main event, and now he’s reaped his award too, after being honored in a winner’s circle ceremony on Woodbine Mile Day where he received his Eclipse Award trophy. 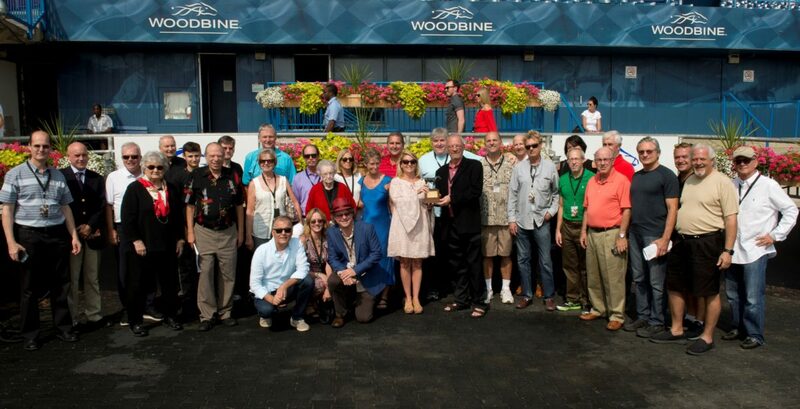 “Ray’s Day” at Woodbine on Sept. 16 consisted of a blanket presentation to the winner of the day’s third race, after which Ray and his extensive group or friends and family were invited to a special Eclipse presentation ceremony in the winner’s circle. Arsenault was saluted by the crowd and then whisked away to a live interview with Simon Bray on TVG, which was present at the track live to cover Woodbine’s huge Woodbine Mile Day stakes-loaded 13-race card capped off by a rich mandatory payout of a sizable Super Hi Five carryover. As for the Woodbine Mile Handicapping Tournament, the day belonged to other competitors in the field of 45 entries for the second annual event which cost $3,500 to enter ($2,000 live bankroll and $1,500 buy-in towards prizes). The Woodbine Mile Tournament also marked the final and deciding event in the Woodbine Player of the Year Series, which decided the winner of a nice prize package that included a Canadian Sovereign Award as Handicapping Series Winner. More on that below. In the Woodbine Mile Handicapping Contest itself, the winner was tournament world up-and-comer ALI AKSOY, 70, originally from Istanbul, Turkey. Playing two entries under the contest handle “Firebird 11,” Aksoy turned his starting $2,000 contest bankroll into a tournament-winning total of $6,092 (real money) based on a minimum of five $400 bets, including win, place, show, exacta, trifecta, and daily double wagers. The victory was the first-ever tournament win for Aksoy, but certainly not his first high finish. Aksoy has been racking those up since last year, having appeared in his first NHC finals this January and already double qualifying this year for the 2018 NHC. Aksoy had already accumulated 9,714 NHC Tour points with several good finishes so far in 2017, and the Woodbine Mile tournament result will add another big point chunk to his growing total. With the $1,500 buy-in and a field of 45 entries, the Woodbine Mile contest was worth $69,000, including cash and the value of two Breeders’ Cup Betting Challenge [BCBC] qualifying spots and four NHC qualifying berths. Aksoy won a BCBC qualifying berth plus $10,000 in prize money in addition to his aforementioned $6,092 contest bankroll. He would also have won an NHC berth, but he was already double-qualified after high finishes in both the Keeneland Grade 1 Gamble and the Keeneland Spring Challenge this year. The second-place finisher… CLINT LITTLEMORE ($5,861 contest bankroll) earned cash and a berth into the BCBC. The Woodbine Mile Day contest’s four NHC qualifying seats will go to third- through sixth-place finishers GREGORY RITZA ($4,261), PAUL SHURMAN ($3,286), MARK FIENBERG ($3,208), and MICHAEL EISEN ($3,018). Eisen got the NHC seat that would have gone to the already double-qualified Aksoy. Speaking of MICHAEL EISEN, the NHC berth he won was only the second-biggest award he secured on Woodbine Mile Day. With his sixth-place finish, Eisen also secured the Woodbine Player of the Year Series championship. The Woodbine Mile Handicapping Tournament was the final event in the Woodbine’s four-tournament Series. Eisen entered the day in first place in the series which had also included Woodbine’s Spring Meet, Mid-Summer, and Weekend Handicapping Tournaments. In addition to the NHC spot earned on Woodbine Mile Day, Eisen also earned a Canadian Sovereign Award for handicapping, and also won the Player of the Year Series’s first prize of $6,500 Canadian dollars. He also receives a free entry into the 2018 Woodbine Mile tournament so he can attempt to do it all again next year.